Not many of us would choose to spend January in the frigid Great Lakes area, but it is the time of the Detroit Auto Show. Therefore, people associated with the auto industry come from far and wide to spend a couple of weeks in balmy Detroit during the coldest month of the year. The show is an opportunity for auto makers to exhibit upcoming models and concept cars, with their hopes and dreams realized in gleaming metal. 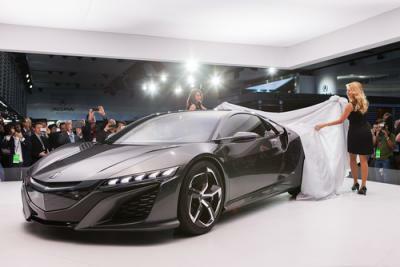 This year's show is an expression of economic optimism with flashy powerful cars in the mix, though there are also numerous green and hybrid models developed with efficiency in mind. Bankers will be interested to note that there were some 16mm autos sold in the US in 2014. That is the most since 2006 and the industry expects to sell even more in 2015. Forbes forecasts auto sales could approach 17mm given easy credit, low gas prices and pent up demand. This level of demand sounds plausible when you consider the average car in the US is 11.4Ys old and this is the oldest on record. The Wall St Journal reports the price of gasoline is changing customer behavior and car makers are scrambling to keep up. Gas was around $3.30 a gallon at the time of the auto show 1Y ago, but is now around $2.13 (a 33% drop). Car buyers have quickly shifted to SUVs and big pickups as a result. In fact, these vehicles represented 45% of the market 1Y ago, but now make up 55% of new purchases. Most projections have gas prices staying low for a while, but clearly the manufacturing cycle for an auto maker can't turn on a dime. It is a little surprising that customers have changed their preferences so quickly and the carmakers at the show are noting the impact. As bankers, we know that lending standards not only in auto but other sectors have been easing for some time. Many are approaching levels last seen before the financial crisis. In auto alone, sub-prime loans for financially stretched buyers are surging, up about 15% from 2013. If these stretched borrowers are buying SUVs and pickups with the idea they can now afford to fill the gas tank, there may be tears ahead if fuel prices rise. Most community banks in the auto lending business are not making sub-prime loans, but instead work through dealers (and therefore hold portfolios of dealer generated auto loans). These types of loans typically have an average duration of 3 to 4Ys and therefore carry little interest rate risk. These loans do carry credit risk though. A buyer may purchase a gas guzzler at the dealer and bases the affordability of running the vehicle and the purchase on today's fuel prices. If gas goes back to $4 a gallon, the borrower may not be able to run their stylish vehicle no matter how much they love it. Most banks don't want the CFO running a used car lot next door to the bank, so underwriting practices in auto and in other sectors should be closely monitored. Shifting gas prices, volatility and other factors can wreak havoc on a loan portfolio, so close analysis and stress testing can help. The auto makers are making every effort to be prudent because they too know that fuel prices and therefore consumer preferences can shift quickly. In fact, the auto show even featured a new Volt from Chevy that can drive 200 miles without plugging in (as it seeks to compete with Tesla). While consumers may not care near term with $2 gas, it sounds like prudent preparation for the future if you ask us. Treasury yields slid 3bps as the investor focus was on the ECB and what steps it will take to bolster the economy. Yields are up 2bps ahead of upcoming housing data. The OCC released a 176 page handbook on retail non-deposit investment products last week, telling examiners what to look for and areas to examine around this subject so bankers should be aware. The booklet describes the risks inherent in such products and provides a framework around how banks should be managing such risks. Common examples of such products include: mutual funds, exchange traded funds (ETF), variable and fixed rate annuities, equities and fixed income securities (taxable and non-taxable). More complex products may also apply. President Obama has launched a new set of proposed legislation to facilitate increased cyber intelligence information sharing. The actions would require a national notification of 30 days when a data breach occurs, expand law enforcement authority and add measures to protect consumers. The OCC says it expects banks to maintain heightened awareness and appropriate resources to identify and mitigate cyber threats and vulnerabilities, and should incorporate cyber-resilience planning and controls into their business continuity planning and testing. Bloomberg reports credit rating agency S&P is close to settling with the Justice Department for about $1B. S&P faced charges related to lying about credit ratings and conflicts of interest on securities it rated prior to the credit crisis. Reuters reports investors in large US banks may have to be patient when it comes to dividends, as a drop in oil prices and the corresponding impact on borrowers and business could slow regulatory approvals to do so and increase loan loss allowances. Reuters said that based on interviews with senior Fed officials and advisors, the middle of this year remains the most likely timing for the Fed to begin raising interest rates. Banks will be taking note and likely soon trying out the tabletop tablets restaurant chain TGI Fridays is rolling out at its 2,000 restaurants to see if a similar idea might make sense in branches. Fed SF President Williams said he thinks June remains a reasonable date for the Fed to begin raising rates given strong jobs data, but that it will likely be a close call.